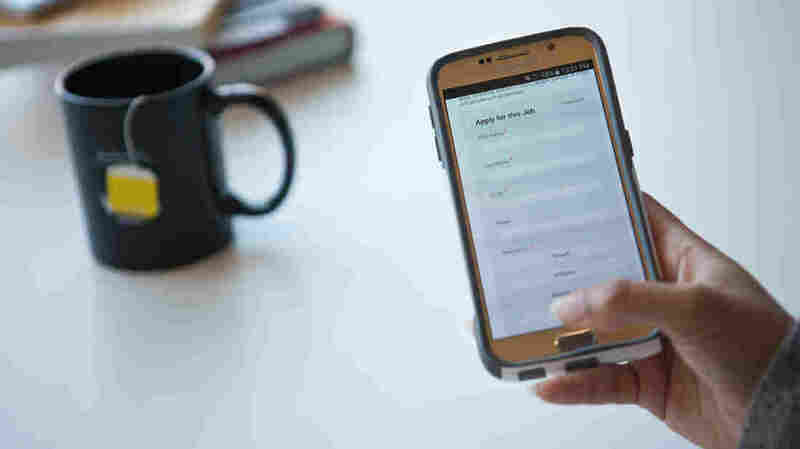 Mobile Recruiting: The Key To Your Next Job Could Be In Your Pocket More job seekers are applying for work from their smartphones. Employers who are trying to push mobile recruiting say that in the tightening job market, it's important to be on the small screen. Employers are increasingly using mobile recruitment tools to make applying for jobs easier and quicker. We shop, watch TV and read news on our phones, so why not apply for jobs from one? Increasingly, we do. Some recruiters say half or more of their applicants apply for jobs using their smartphones. "I probably applied for 90 percent of my positions on my mobile device," says Kirk Coleman of Plano, Texas. Coleman says he was fine letting his thumbs do the talking, filling out forms and connecting to his LinkedIn profile. "Being the generation that I am, a millennial, people kind of want it here and now. That's the mentality with this generation, and so it makes sense for employers to kind of cut out the fluff and some of the process so people can actually do it from their mobile device," he says. Applying for a job has shed some of the old formalities: the resume printed on nice stock paper, for example. Still, using a phone seems fraught with danger. What about the fat finger problem or the tedium of reading and filling out job applications on a small screen? That doesn't bother Coleman. In fact, he says, he thinks applying for jobs on his cellphone made him more competitive. It's much easier to hit 'apply' on your cellphone and take 15 minutes and fill out a basic application on your phone than it is to wait till you get home. "It's much easier to hit 'apply' on your cellphone and take 15 minutes and fill out a basic application on your phone than it is to wait till you get home," he says. Coleman should know. The job he landed was as a recruiter for a bank. "Within a month of my search, I had three offers, so really it took less than a month from start to finish," he says. Craig Fisher, director of talent marketing for CA Technologies, says the point of having mobile recruitment tools — ones that are streamlined and require minimal clicks — is to make applying for a job easier, more casual and faster. "The candidate experience is now of paramount consideration for employers because it's a candidate-driven market. There's a real war for talent," Fisher says. He says more than half of his company's job applicants use their mobile devices, and the cellphone-friendly process has led to an increase in applications overall. This is especially helpful when it comes to filling high-tech positions, where talent is often in short supply. "The engineers don't have time to talk to 15 recruiters a day so they may just go online and apply or straight to the phone to look at that job and, if it's easy to apply, then perhaps they'll do it," Fisher says. And, just as marketers are pushing coupon ads on mobile phones, recruiters are looking to use the same concept to attract job candidates. "You can actually target marketing and specific jobs to candidates segmented by their various fields of specialty," Fisher says. Dan Ryan of talent acquisition firm Ryan Search and Consulting near Nashville says companies that don't have recruitment systems set up for cellphones are lagging behind. He says he uses FaceTime to interview candidates. And while many people are comfortable relying on the smartphone, Ryan acknowledges not everyone is there yet. "One of the areas where I've specifically seen it be a downside is for boomers or even on the older side of the boomer generation, if they're not technologically savvy, they're missing out on the opportunity to gain information. Gain access, in a quicker format than, say, maybe a millennial who's grown up with this kind of technology his or her entire life," he says. Ryan himself says it helps him stay in touch with candidates in a more familiar and intimate way than was possible before. "Ten years ago using a text to share information with a candidate wasn't something that happened very often. I'm texting with candidates all the time now," Ryan says. He says you have to go where the talent — and the times — take you.